My Country Roads: Wild and Wonderful : Happy birthday Sissy Mae! If you regularly visit my blogs, I am sure that you notices that I am doing a lot of sponsored posts. The main reason behind it is my youngest sister Mae. 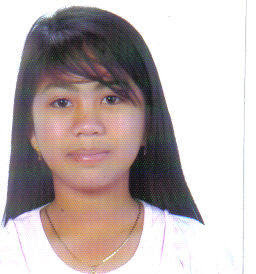 She is enrolled now in College (1st year) and we are the one financing all her expenses. You might have remembered I posted my disappointment about her not getting into the student assistant program in the school where I work then, but she actually got in through the help of a friend of mine. So that is a big help because it is 21 units free of tuition fee, all she have to pay is the miscellaneous fees. I just hope that my sister would do good in her job so she won't be fired. Getting into a student assistance program is good because not only that it help you financially, it also honed your social and working skills. It is also a good job reference when you graduate, if the school like your performance during your duties as an SA. So hopefully she will stick to it and love her job. I am keeping my fingers crossed! The most expensive part of sending her to school is her monthly allowance and the board and lodging. That is why even if my husband is very much willing to shoulder all the expenses, I want to contribute some through blogging. Now that we are sending her to College two of my siblings wanted to go back to school too but I told them that they blew off their chances when they stopped. I wouldn't mind sending all of them to school if my husband and I do not have kids but we do, so our priority is our children. But anyhow, my sister will be celebrating her 16th birthday ont he 11th of this month, a day after yours truly's birthday hehehe. May you strive hard to reach your ambition Nene, we are willing to help you but you have to help yourself too! We love you very much! God will bless you for being so helpful and caring sis to your sibling despite having your own children. Happy birthday to you first and to your sis as well. Happy sweet 16th birthday to your sister Sissy Mae, and happy birthday to you too! I wish you both happiness. Being into student assistance program is a good opportunity, one will enjoy not only free tuition fee but will also develop ones sense of independency. nakisali na rin rose. happy b-day to your sister. she is lucky to have you as her sister. Ang sarap pakinggan diba, na we are always willing to help our siblings as long as kaya natin. Ayaw nating makita yong mga kapatid natin na magkahiraphirap in the future. So habang may matutulong tayo ok lang. Yeah I remember that incident. My school is run by Jesuit and if you qualify and passed, they do not mind it if there are siblings in the US. Well, at least she went through right? We knew the importance of education specially when we go through all these. I am a Student Assistant myself so, I know. I hope she will grow more like you....determined to finished College. I have my own share of disappointments too. I send two cousins in Ateneo and set aside my MA degree.They gave me 4 F every semester... Eventually, they stopped and work in MODTRADE. Sad but, it is their choice. I wish your sister all the luck, good ones. I hope she will focus on her studies and polished her skills while working as SA. I hope she will prioritize studies than LOVE. Hehehe...kakaloka girl noh. Happy Birthday pretty face. WOW, you are a wonderful inspiration to everyone. Please tell her Happy Birthday! I can't even imagine the burden of having children and helping a sister through school. You really are wonderful! that's tomorrow,,, wow happy birthday to your sis, and I wish her goodluck to her studies... it a is rewarding feeling helping special one to finish studies.. Happy Bday to your sissy, Rose :-)...and of course, to you, too! Happy Birthday Sissy Mae. May you have many more blessed and fruitful birthdays to come. Just follow the footsteps of your ate Rose and you can never go wrong. Thanks for the post. God bless you always. wow..super bait mo kaya manang...kaya love na love ka ni Lord...hehehe..am sure she will do great on studies and on her job...:) Happy Birthday to your lil sis! Hope all her wishes and hopes will come true as well as yours..
your siblings are so blessed to have you Rose. You are such a caring and a loving sister. Happy birthday to you and wish you more blessings to come. good luck to your sister and happy birthday also to her. Napakabait mong ate! Happy 16th bday sa sister mo at sayo naman ay happy 17th bday! I mean... mukha ka kasing 17 e! hehehe! Naku nambola pa daw ako... kidding aside, I wish the 2 of you will have a wonderful birthday! God bless! Happy Birthday to you rose and to your sister! :) my mom's birthday also yesterday. ahihi.